Garage doors are an essential part of our home. They are often taken for granted, but are used several times every day. Like your home itself, you expect it to last years with minimum maintenance. The life span of a garage door is influenced by several factors. The manufacturer, the quality of materials and most importantly maintenance. While the expected lifespan of a garage door is close to 30 years, it will require some maintenance to get close to that figure. The first step is to maintain the garage door itself. Wash both sides of the garage door with a water and mild detergent solution. Follow this up with a clean water wash. Waxing the garage door with your car wax can increase protection against the elements. 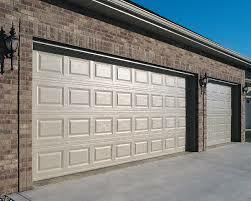 Wooden garage doors could also use a coat of paint when you see signs of excess wear and tear. For larger issues it would be better to a get a specialist in garage door repair atlanta. When it comes to the garage door opener, be especially attentive to the sensors. These are also referred to as the door openers eyes. The eyes will prevent the door from activating and is an important safety mechanism. Much like the garage door itself, maintenance here is to clean the sensors regularly. This time with a clean dry cloth. Additionally keep the surrounding area free of cobwebs and dust.